The Civil Rights Learning Journey runs from Jackson, Mississippi to Birmingham, Alabama, led by a Civil Rights leader, Roscoe Jones Sr. This bus tour focuses on both places and stories that delve deep into the movement, lifting up the narratives that shaped the past and inform the present. Recent participants have applied the lessons learned to their research approaches, organizational strategic plans, and curriculum designs. The 2018 journeys were attended by school teachers, principals, superintendents, after-school professionals, researchers board members, college and university faculty and staff, community agencies, non-profit and philanthropic leaders, consultants, and others. "The IEL tour provided an impactful history lesson and more importantly, gave me a charge and a challenge." “I made this trip at a time of rising anxiety among minorities and many whites about the increase in hate-related behavior following our recent presidential election. The question hanging over us: will we allow the past to repeat itself?" Read his full blog here. 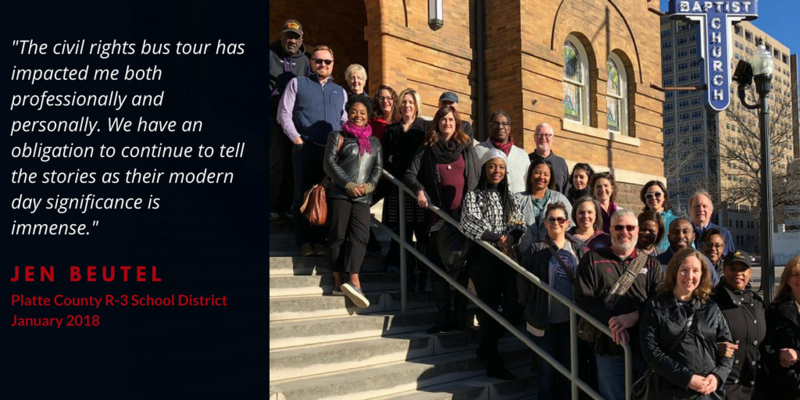 “We realized on the last day of our bus tour that we as a group had unified around this common powerful experience, and pledged to support one another in our own work to advance civil and human rights." "The Civil Rights Bus Tour emphasized to me that there are no bystanders in the movement for equality and justice, but that this is all of our fight, and it continues to this day."